In November 1919, President Wilson proclaimed Nov. 11 as the first commemoration of Armistice Day. The original concept for the celebration was for a day observed with parades, public meetings, and a brief suspension of business beginning at 11 a.m. The U.S. Congress adopted a resolution seven years later in 1926 directing the President to issue an annual proclamation calling for the observance of Armistice Day. In 1938, Congress passed legislation making Nov. 11 a legal federal holiday, Armistice Day. World War II and the Korean War created millions of additional war veterans beside those the First World War already honored by Armistice Day. 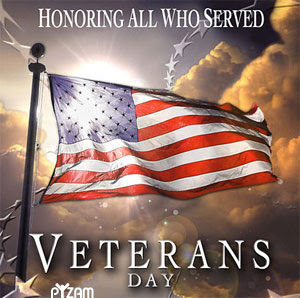 In 1954, President Eisenhower signed legislation changing the name of the legal holiday from Armistice Day to Veterans Day to honor veterans of all wars. The Uniform Holiday Bill, signed in 1968, was intended to ensure three-day weekends for federal employees by celebrating four national holidays on Monday: Washington's Birthday, Memorial Day, Veterans Day, and Columbus Day. The fourth Monday in October was established as the new date for the observance of Veterans Day, to take effect in 1971. The first Veterans Day under the new law was observed with much confusion on October 25, 1971. It was quite apparent that the commemoration of this day was a matter of historic and patriotic significance to a great number of our citizens, so in 1975 President Gerald Ford signed legislation to return the federal observance of Veterans Day to Nov. 11, based on popular support throughout the nation. The restoration of the observance of Veterans Day to Nov. 11, not only preserves the historical significance of the date, but helps focus attention on the important purpose of Veterans Day: A celebration to honor America's veterans for their patriotism, love of county, and willingness to serve and sacrifice for the common good.